Dental implants are one of the most advanced options available for our Mt Gravatt East family dentist to replace your missing teeth. Each one is designed to mimic the look and function of a natural tooth root, allowing us to support a fixed restoration such as a crown, bridge or denture. We work with a visiting Prosthodontist specialist so that you can complete your entire implant therapy right here in our office. Implants are a permanent option that can last an entire lifetime. While missing teeth often lead to changes in your facial profile and the integrity of your bone, implants work to preserve these characteristic features. Placing them soon after a tooth has been extracted can prevent gum shrinkage and bone resorption. They’re even considered to be stronger than natural teeth. The biocompatible material that implants are made from triggers new bone growth, allowing the titanium root to fuse permanently with your jaw. After the surgery, it takes a few months for this osseointegration process to fully complete; once it does, your fixed prosthesis can be attached. Depending on your particular situation, it’s sometimes possible to extract a problematic tooth and place a dental implant on the same day. As the area heals, you’ll wear a temporary crown. About four months later, the permanent implant crown will be installed. 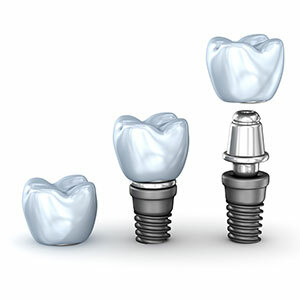 Permanent implant retained dentures are also available! Experience the freedom and confidence that dental implants can offer. Schedule a complimentary exam with our Prosthodontist specialist to learn more. We’re open late and on Saturdays.